It's been three years since the devastating accident ... three years since Mia walked out of Adam's life forever.Now living on opposite coasts, Mia is Julliard's rising star and Adam is LA tabloid fodder, thanks to his new rock star status and celebrity girlfriend. When Adam gets stuck in New York by himself, chance brings the couple together again, for one last night. As they explore the city that has become Mia's home, Adam and Mia revisit the past and open their hearts to the future - and each other. 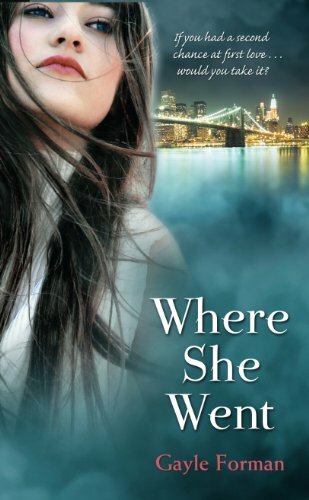 Where she went picks up three years after if I stay. It is told from Adam's point of view he is a Rock star, Mia is a a rising star having graduated Julliard early and they haven't seen each other in three years. I did enjoy this book. I loved getting back to Adam and Mia as I really loved If I Stay. I thought the idea of it (even though it almost pained me to think that they weren't together) was awesome and I loved getting into all the whys and wherefores of how it went wrong from them both. I thought Adam was brilliant gorgeous in this and actually felt bad for him throughout the whole book and cross with Mia for treating him as she had. I think it also had an interesting message about fame and the reality of it for those who achieve it. As the story progressed I loved getting under the skin of the characters once again and finding out about them and what went wrong between them. I thought it was brilliantly done and loved how the story was teased out by the author throughout the story. The final ending was awesome and I was really pleased with how it turned out. I love nothing more than a book that finishes well which this certainly did. All in all a worthy sequel which was as well written as the first instalment and just as engaging! I was really, really mad at Mia while reading this book. I mean, it's probably one of the cruelest ways to break up with someone. I love Adam and the writing was sooo good! I thought the ending was nice as well. I found this book to be absolutely heartbreaking! Oh the tears.. I must get around to reading this soon! I am looking forward to getting a copy of this one. It sounds good, but I guess I'll need a box of tissues to hand. Sounds like a good book, thanks for the review.